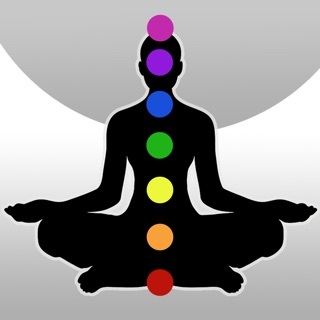 The "Meditation Time App" is a simple and clean timer for your meditation session. 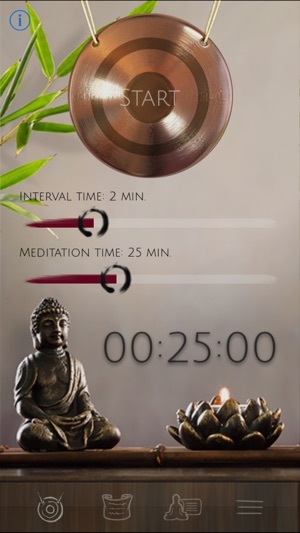 It lets you set the duration of your meditation and offers a mindfulness bell that rings in an adjustable interval. 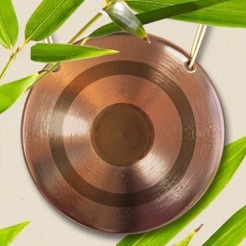 Choose from a wide variety of Tibetan singing bowls for the gong. If your surroundings (or your mind) happen to be a bit more noisy, turn on the relaxing natural sounds during your meditation and find that peaceful and quiet place within you. We also included some basic teachings and a very pleasant guided meditation to help you find the way. "Meditation Time is a light and practical support for my meditation without any distractions. " "A very well crafted app for meditation with an inspiring design." "This app breathes consciousness, sparkles with spirit and is so usefull at the same time." I started to consistently meditate last week. After doing the starter guided meditation for 30 minutes my body pains were gone that day. I haven’t felt pain free for many, many, months. Having my own business and dealing with clients add stress. Although I workout, apparently, I was not releasing mental stress. I had pain everywhere and I do not like to take drugs; therefore, I just deal with it. Some days, I do yoga ad gentle stretches too. But still most days I’m in pain. I can’t believe the very first day I did the guided meditation my body was so relaxed. It seems to be the only thing to give me deep stress relievers. I love the ability to use the background sounds and can rely on the timer to go off with the gong sounds I choose. So I am meditating daily anywhere between 15-30 minutes a day. Thank you developers. I appreciate this app. Namaste. I have been meditating now for over a year. Just had a visit with my doctor and my blood pressure is way better overall. And even after three minutes of meditation, my blood pressure will drop 10 to 15 points both diastolic and systolic. Western medicine likes to call it mindfulness because they don't want to be stereotyped with Buddhism. I do not believe every single thing of any religion. I try to take what is beneficial for my soul and spirit from each. I am sorry to my friends and family who feel from their different religious viewpoints that I will go to hell. That makes me a little sad, but I am learning to let go of things I cannot control. And one of the big things I cannot control is other peoples views. I have also learned to really stop judging others and myself. Most of us intend to be decent people. You may want to try to meditate to have more peace in life. Not trying to be preachy, I guess I just care about people because I know what it's like to have severe anxiety. Meditation, like anything it takes time to learn. There are a few types, find the one right for you. I wish and pray for peace, love, and all good things to everyone. I’ve been using this app for about a week and already it’s my favorite meditation app ever. It is simple. It’s design is elegant. It doesn’t have a lot of bells and whistles, but you don’t need a lot. It lets you choose the amount of time you want to meditate in five-minute increments. It has a fair number of bells and chimes for sounds. It has mindfulness times and timing. It does whatever you want. If I had a single quibble, I would want to have the time increments be by the minute instead of by the five minutes. But that is only for people who are trying to extend their Meditation Time and don’t feel ready yet to do a full five-minute jump. Otherwise this app is perfect.